All Library Board meetings are held at 6:30 pm on the third Tuesday of the month at the Library, 405 Main Street, Lyons, CO 80504 unless otherwise noted. The Board of Trustees of the Lyons Regional Library District announces the appointment of Rebecca Schuh as our new Director of the Lyons Regional Library. The Board was particularly impressed by the depth and breadth of Rebecca’s experience, which includes significant work in strategic planning, building community partnerships, administration, reference, finance, project management, patron services, programming, and human resources management. She has been with the Campbell County Public Library system (Gillette, WY) for the past 11 years, and before that was with the Rapid City Public Library. Rebecca holds an MLIS and BS from the University of Alabama and is a graduate of both the Wyoming Library Leadership program and the Gillette Area Leadership Institute. She is past president of the Wyoming LIbrary Association. We are excited about the opportunity to bring her wealth of talent and experience into our community to complement that of current staff. Rebecca replaces Katherine Weadley, who left in 2018 for a new position with CLiC (Colorado Library Consortium). Rebecca will begin in Lyons on March 18, 2019. We extend big heartfelt thanks to all those who participated in the lengthy and competitive recruitment process: community members, staff, Friends, Foundation, Search Committee, and Board members. Our special appreciation goes to our amazing staff, who have been doing an extraordinary job while working short-handed. And most especially of all, kudos to Adult Experiences Librarian Kara Bauman, who stepped up magnificently to serve as Interim Director in addition to all the planning work for the new building. Kara will continue in leadership roles. Rebecca is “thrilled to be joining the team at Lyons Regional Library.” When not at work she loves paddle-boarding, playing board games, reading, and assembling Legos. The entire Schuh family, which has a home in Loveland, is looking forward to the next chapter of their Colorado lives. In the coming weeks we will be planning a social gathering so that all who have not yet met Rebecca can get a chance to know her better and give her a warm welcome. 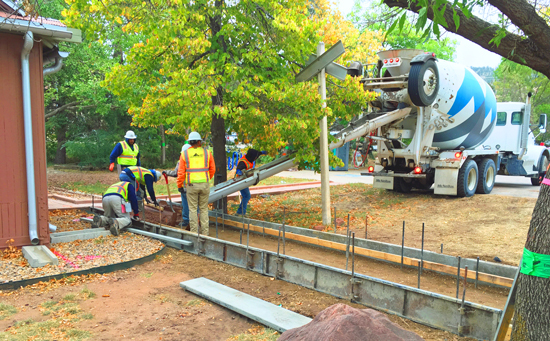 Thanks to a generous donation of stone by Blue Mountain Stone (Raul Vasquez) and a grant from Boulder County Worthy Cause, our capital project is now fully funded. We have reached the finish line, and can now turn our attention to outfitting the building with furniture, fixtures, equipment, and technology to serve the community. Despite a bit of cold weather, our construction is still on schedule for a Summer 2019 completion. Blankets and plastic sheeting prevented the sub-floor from freezing, and on Dec. 12th the actual slab-on-grade floor was poured. Bill Palmer (of the Foundation) arranged for donation of an excellent quality vapor barrier from Stego Industries. Thank you, Bill and Stego! All in-floor electrical and plumbing is now installed. 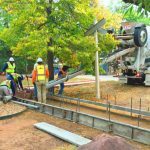 The next step is wood framing, which is expected to continue for the next six weeks through the end of January, weather permitting. What’s next? In order to save costs and get construction underway, the draft amount budgeted for furnishings, fixtures and equipment (FF&E) and technology was kept as low as possible. Lower, in fact, than the recommended amounts of tables, desks, chairs, computers, printers, and shelves for a building of our size and function. As 2018 winds down the staff and architects are conducting an inventory of current holdings, equipment, and furnishings with a mind to re-using as much as possible. They will then come up with the minimum additional needed for Opening Day in summer 2019. They will also develop a wish list of future desirable FF&E plus Tech to be added as we can. Those cost numbers, when they come in, will drive the “Final Mile” funding goals for 2019. There were plenty of smiling faces at the historic groundbreaking ceremony for the new library building. We’re still smiling because excellent weather conditions have allowed the work to progress nicely. Building Committee Chair Sandy Banta reports that site utilities and light posts are being installed, footings are being poured, and parking lot grading is being completed. 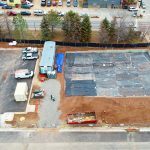 There will be a big push to get the first layer of asphalt on the parking lot because once that happens then Fransen Pittman will be able to use the parking lot as its staging area and move its equipment off the street. Fourth Avenue will not have to be blocked off for the entire length of the construction project. So keep your fingers crossed for continued good weather and good construction progress. The Lyons Regional Library District is pleased to announce that we have our building permit and construction has begun! Over the past few weeks Town of Lyons has been clearing structures from the new library building site in anticipation of our construction start. 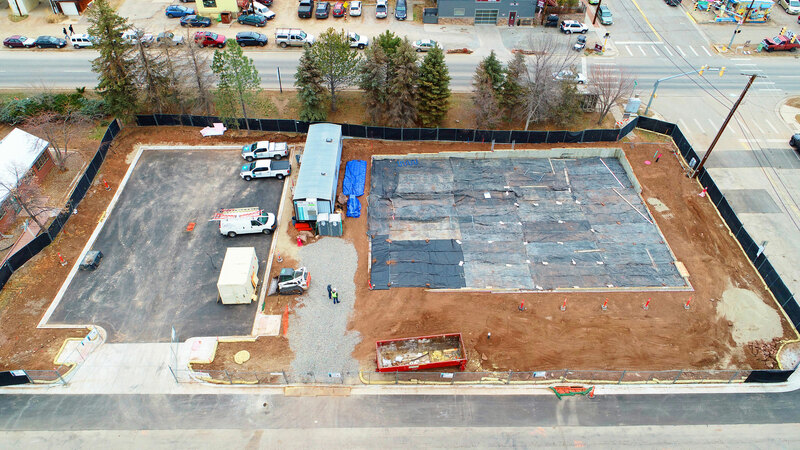 The Recycling Center has been moved to Second Avenue (across from the Bohn Park entrance), and the RTD long-term parking has been moved eastwards to the Railroad Avenue frontage road by the new Habitat for Humanity townhomes. Stay tuned for more updates on our progress and a groundbreaking ceremony announcement. The Lyons Regional Library District was created in September 2013 to build and operate a new library following the disastrous flood that destroyed much of the library and the Town of Lyons. On July 1, 2015, the Library officially became the Lyons Regional Library District and began to serve its expanded population. The Library District generally covers the same area as the Lyons Fire Protection District and is governed by a separate board of trustees appointed by the Town of Lyons, Boulder County and Larimer County. The Lyons Regional Library District serves people in both Boulder and Larimer counties. All Library Board of Trustee meetings are open to the public. Contact the Board by email at board@lyonsregionallibrary.com or write to Lyons Regional Library District Board, PO Box 619, Lyons CO 80540.